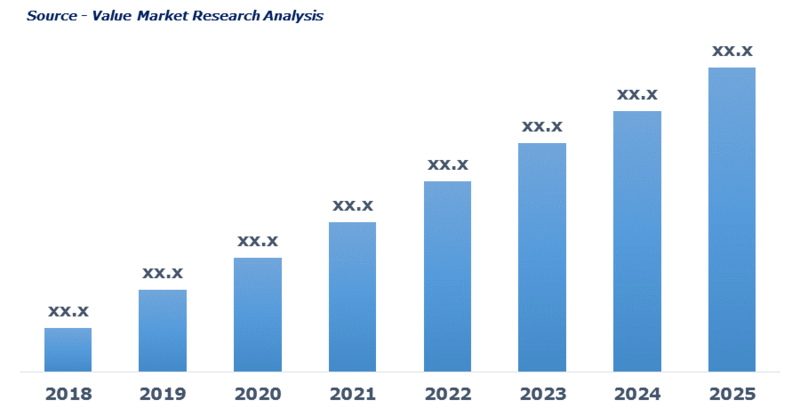 As per this study the Global Oatmeal Market was valued USD 2.3 BN (by revenue) in 2018 and is anticipated to reach USD 3.0 BN by 2025 with a CAGR of 3.5%. Oatmeal is the healthy breakfast cereal made up of rolled and milled hulled oat grains. Oatmeal is a rich source of proteins, starchy carbohydrates, dietary fibers, vitamins, and minerals. Apart from this, it includes antioxidants and various bioactive compounds that aid in safeguarding against chronic medical conditions such as heart disease, diabetes, and cancer. Ideally, oatmeal is consumed in form of porridge when cooked with milk or water, but nowadays, oatmeal cookies, cakes, and desserts are widely consumed owing to its nutritional benefits of oats. The rising popularity of oatmeal owing to its high nutrient contents and ease of cooking is driving the market growth. Growing health-conscious population leading to high preference towards healthy meal is further fueling the oatmeal market growth. The wide range of flavored oatmeals is again pushing the market growth. Also, However, the availability of substitutes such as cornflakes, buckwheat groats, and quinoa, may hamper the market demand. Nevertheless, growing demand for oatmeal cake, cookies, desserts and other ready to eat snacks is expected to fuel the market growth in the coming years. This detailed market study is centered on the data obtained from multiple sources and is analyzed using numerous tools including porter’s five forces analysis, market attractiveness analysis and value chain analysis. These tools are employed to gain insights of the potential value of the market facilitating the business strategists with the latest growth opportunities. Additionally, these tools also provide a detailed analysis of each application/product segment in the global market of oatmeal. The broad oatmeal market has been sub-grouped into type and distribution Channel. The report studies these subsets with respect to the geographical segmentation. The strategists can gain a detailed insight and devise appropriate strategies to target specific market. This detail will lead to a focused approach leading to identification of better opportunities. Furthermore, the report comprises of the geographical segmentation, which mainly focuses on current and forecast demand for oatmeal in North America, Europe, Asia Pacific, Latin America, and Middle East & Africa. The report further focuses on demand for individual application segments in all the regions. The report also covers detailed competitive landscape including company profiles of key players operating in the global market. The key players in the oatmeal market includes Bagrry's India Ltd., Cargill Incorporated, General Mills, Inc., Hamlyn's Of Scotland, Kellogg Company, Nature's Path Foods, Inc., Nestle S.A., PepsiCo, Inc. (The Quaker Oats Company), Post Holdings, Inc. (Weetabix Ltd.) and World Finer Foods Inc. among others. An in-depth view of the competitive outlook includes future capacities, key mergers & acquisitions, financial overview, partnerships, collaborations, new product launches, new product developments and other developments with information in terms of H.Q.